Odile is a peony full of life: the buds of this flower become big, firm flowers. These white flowers have a lilac heart and fit perfectly at weddings and events. Odile, a so-called ‘big white’, is the earliest peony in her segment. Her flowers are full like roses. The hearts of the flower are lilac colored. Odile is legendary because of her productivity and flowering power. As a result, her flowers get enormous. Her stems also reach an unique length: sometimes up to 80 centimeters. Her size is the reason why this peony looks spectacular at weddings and events, for example as festive decoration in a vase. You can find this peony in Mediterranean countries: France, Spain and Italy. Odile is a peony that often got harvested too early, hence the flower opened up pretty bad. Such a pity, because this flower is insanely beautiful. Luckily this flower has made its comeback and has never been represented so strongly in our assortment. Odile is an all-time classic from the French era. Doriat found and registered her in 1928. 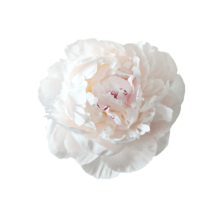 Doriat has also discovered Madame Claude Tain, a snow white peony. Since her comeback, she has gained immense popularity among peony fans.